You could call this particular column the Internet of Toolsmith. As much as I am a curmudgeonly buzzword, catch-phrase hater (I lose my mind at RSA and refuse to go any more), the Internet of Things, or IoT is all the rage for good reason. Once obscure items are now connected and as such, at risk. The ability to load a full operating system and a plethora of functionality on a micro device has become trivial thanks to the likes of Raspberry Pi and Arduino. I’d like to point out that the Pwnie Express PwnPlug Elite, built on a Sheevaplug, as discussed in March 2012’s toolsmith, was amongst those devices that met the IoT bar before IoT was all the rage. Kudos to that crazy pack o’ hackers for seeing the imminent future of security challenges with smart devices. In 2013 Chris Clearfield wrote Rethinking Security for the Internet ofThings wherein he stated that “the growing Internet of Things, the connection of physical devices to the internet, will rapidly expand the number of connected devices integrated into our everyday lives. They also have the potential to allow cyber attackers into the physical world in which we live as they seize on security holes in these new systems.” It is in that mindset that we’ll converge security assessment tools and services, as implemented on a couple of tiny devices I’m fond of, with ISSA Journal’s topic of the month. Normally, toolsmith focuses on free and open source tools, and the software we’ll discuss this month continues to meet that bar. That said, it’s impossible to explore IoT without some related “things”, so you’ll need to make a small investment in one or both of the devices we’ll discuss, or experiment similarly on related platforms. If you were to purchase the Wifi Pineapple and the Raspberry Pi 2 (RPI2) kits I own, you’d spend a grand total of $229. Much as the Pwnie Express crew did, the hak5 team started building WiFi penetration testing platforms on tiny hardware as early as 2008. The Raspberry Pi project has enabled all sorts of makers to build miniature attack or assessment systems on devices the size of a pack of playing cards. We’ll drop Kali Linux on a Raspberry Pi 2 here. I chuckled a bit as I wrote this as I was reminded that WiFi Pineapple, intended for WFi hacking, was itself popped at Defcon 22. The language in the resulting message is too salty to print here but it starts with “Dear Lamer” and ends with “criminally insecure” which should convey the general concepts. ;-) That said, the Hak5 team addressed the issues quickly, and the device really is a sound, capable investment; let’s start there. Wifi Pineapple use is about as easy as plugging in, connecting the included Cat5 cable to a DHCP-enabled NIC, and browsing to http://172.16.42.1:1471. “The WiFi Pineapple firmware is a heavily modified version of OpenWRT, packed with tools to aid your pen testing.” Initial username is root, you’ll assign a password during initial setup. I did flash my Pineapple to the latest firmware, 2.3.0 as this was written, using the WiFi Pineapple MK5 Infusion. Using the Network Infusion, I put my Pineapple in Client Mode, so I could connect to the Internet for updates and install additional Infusions. Using the AutoSSG Infusion I setup the AutoSSH service so I could interact with a remote shell and download/upload file via SCP. Real fun with a Wifi Pineapple can be had when you add Infusions. I immediately added sitesurvey, status, monitor, logcheck, connectedclients, notify, and wifimanager as seen in Figure 2. Make sure you install all Infusions to SD storage as there is much more available in the SD card, you’ll quickly clog internal storage if you’re not careful. While WiFI Pineapple is first and foremost a Wifi attack platform, I believe it can be used as a defensive platform as well, in particular a monitoring sensor particularly in an area where many WiFi connected devices are in play and you’d like to monitor the local IoT. In the Logs Infusion I followed the /tmp/pineap.log which logs probes for SSIDs by MAC addresses. The PineAP Infusion, with MK5 Karma enabled, will allow you to filter under the Log tab as well. From the Pineapple information content under the PineAP Infusion states that “MK5 Karma is a module of the PineAP suite intended to host spoofed Access Points, or honeypots. This is achieved by replying to probe requests with appropriately crafted probe responses.” You can tweak MK5 Karma and Pine AP as a honeypot to ensure only trusted, known devices connect in your environment. You can then blacklist and whitelist both clients and SSIDs, then send notifications via email or Pushover based on specific rules if you so choose. All the related Infusions are noted in Figure 3. As a result, WiFi Pineapple, while a fantastic red team tool, can also be used for defensive monitoring in a highly connected environment where only trusted devices are a requirement. 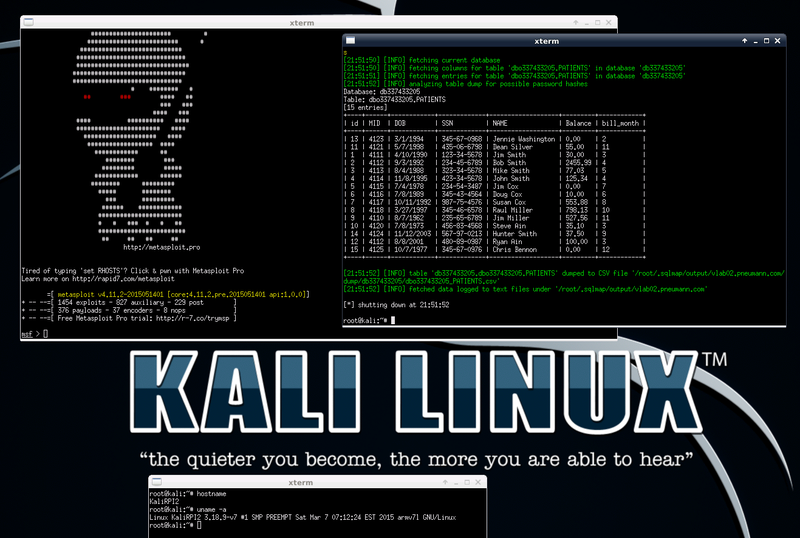 A bit of patience as kali-linux-full exceeds 3GB, and voila, you’re running Kali on a kick@$$ wallet-sized computer! 2) There is a location in the public space near a cabinet and a large plant where a WiFi enabled RPI2 (Figure 4) can be plugged into both power and one of the unregulated wall jacks. Even if discovered in a day or two, you only need a few hours. After “installing” your device, you can access it over the public WiFI as wlan0 is serving up SSH in the same IP range as your laptop. You’re simply sitting in the organizations public café, seemingly browsing the Intarwebs during lunch. As an added bonus, you find that the wired connection to your RPI2 enjoys unfettered access to the internal (Intranet) environment. You nmap it accordingly and discover a few hosts offering up HTTP and HTTPS. You can kick in a little X11 forwarding on your RPI2 or tunnel through your RPI2 and browse the sites directly from your laptop in the café. Sure enough, after a bit of review, you discover that one of these web servers hosts the front end for that health services database you seek. You quickly recognize that the Security Development Lifecycle long ago left the building (may never have entered) and that this front end is rampant with SQL injections vulns. You ready SQLmap and strike while the iron is hot. You run the following from your RPI2 and in four quick steps have dumped the patient db. Great, now you have to write the report. The above gives you the database banner, the populated databases, the tables in the db337433205 database, and then,yep, there’s the proverbial gold in that dump (Figure 5). By the way, if want to take screenshots in Kali on and RPI2, you’ll need to run apt-get install xfce4-screenshooter-plugin to enable the app, you’ll find it under Accessories thereafter. This is but one example of an endless slew of opportunities running Kali and other distros from this credit card-sized device. Grab some spare SD cards and build out a few of your favorites, then swap them in as you want to boot them up. Some RPI2 kits come with NOOBS on an 8GB SD card as well, which will help get you started and your feet wet. Hackers/makers rejoice! I’m going to add sensors and a camera to my kit so I can implement specific scripted actions when movement initiated. Working with the Raspberry Pi 2 or earlier versions allows you so many options. You’ll recall that FruityWifi, as discussed in November 2014, is specifically tailored to Raspberry Pi, and there are Pwn Pi, Raspberry Pwn (from Pwnie Express), and MyLittlePwny, amongst others. Grab a kit today and get started, it’ll be great for your Linux skills development, and can be used for attack or defense; the options are literally endless. I’d also be remiss if I didn’t mention that Microsoft is releasing Windows 10 for IoT (Windows 10 IoT Core), currently in Insider Preview mode, so you can play on the Windows front as well.